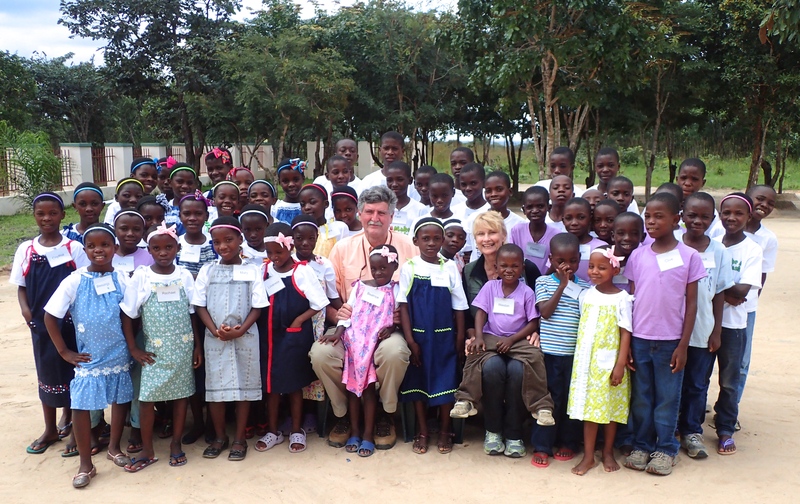 It is always exciting to return to Agape Orphanage in Zambia, even after having been there dozens of times. Among the many things that we planned to do on our trip this last October, the best was to meet the newest Agape children. What bright smiling faces met us! The wonder in this is that these children have come to Agape Orphanage from such bad situations, but it is evident that they now feel safe and loved. This “gang of six” pictured right, consists of Michael (3 yrs), Juliet and Alice (5 yrs), Danny, Isaac, and Margaret (6 yrs). It gives us great pleasure to see what God has provided at Agape Orphanage so that these young children can have a chance in life. 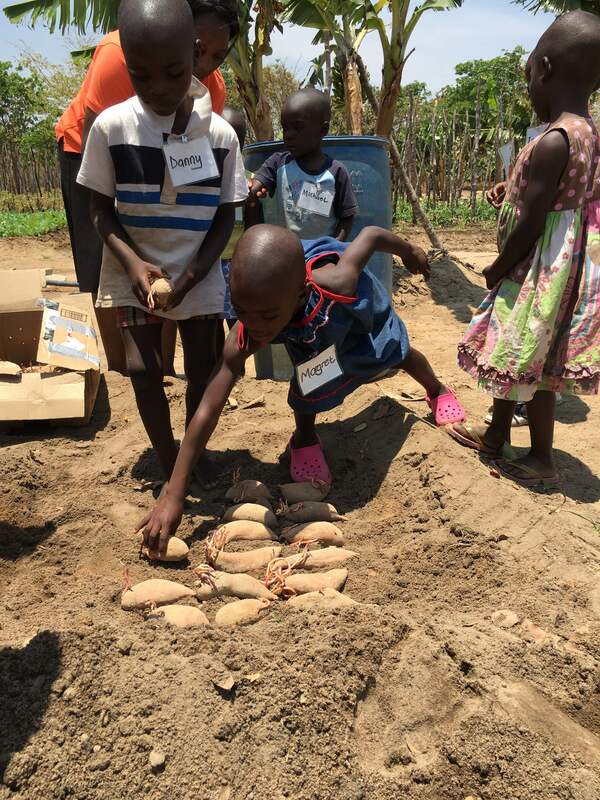 Pictured below, the youngest children learned how to plant the sweet potatoes that we introduced on this trip. Zambia does not grow sweet potatoes as we know them, and we have been anxious to add this nutritious vegetable to our wonderful Agape garden. Once these potatoes sprout, there will be lots of sweet potato plants for the garden. Watering a garden in Zambia is usually done totally by hand. Because the Agape garden feeds over 60 children it is quite large, and our gardener has been spending 5 hours each day just on watering. We have, therefore, been wanting to install some type of irrigation system to help him with this job. 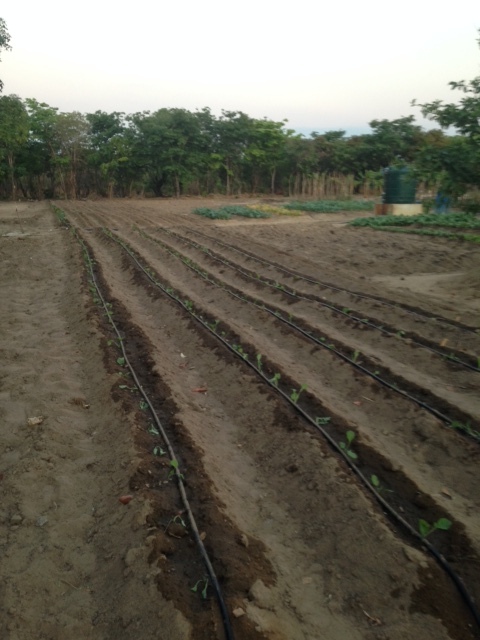 In October, we installed a drip line irrigation system from our well, and all the gardener has to do is turn a valve. Now he has lots of extra time for his other chores. Another first for us on the October trip was video conferencing. For years we have dreamed of being able to connect in real time by internet to a school classroom or to a church in America. On October 11 at 4:15 PM Zambian time, 10:15 AM American time, we connected to Sydney Boggs’ 3rd grade classroom in Efland, NC. We were thrilled to finally connect after many failures. 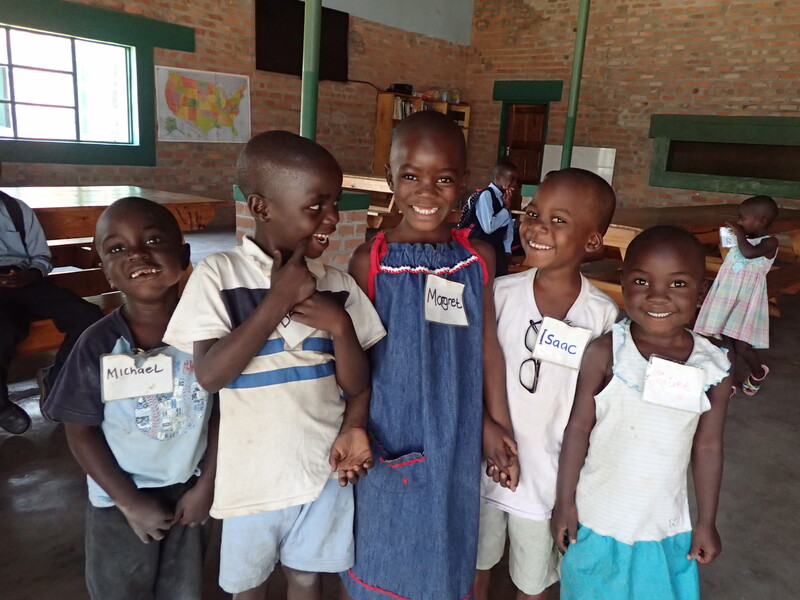 The Agape children were very excited to see children in a classroom in America, and we could see that Sydney’s class was thrilled to connect with our children in Zambia. The children shared names, talked about what foods they preferred, and then each class sang a song to the other class. It was an amazing moment, not only for the children, but for the teachers and for all of us. Thanks to Sydney who, along with her husband Zach, spent a month last summer at Agape Village Orphanage working and bonding with our children. Education has always been a big concern for us. One of the reasons we built Agape Village Orphanage was to make sure that these orphaned and vulnerable children could go to school, be properly educated, and have a better chance at life. We have learned over time that the government schools, especially in the “bush” where we are located, are often less than desirable. In our village there have been many times when teachers did not show up for class and, recently, our 3rd grade students did not receive complete end of term scores because their teacher had come to class intoxicated on so many occasions. Add to this the fact that the classes our children attend in the local school regularly have from 45 – 55 children per class, and one can readily understand why we found it necessary to hire 2 full time tutors at Agape Orphanage this year. Having Jacob and Friday working with our children each day at the orphanage has made a big difference, but this still has not resolved the issue and we are beginning to feel that much of the time our children spend in the local school each day is wasted time. After much prayer and thoughtful consideration, we believe our next phase at Agape Village Orphanage is to build a school where our children can be properly educated. It will be a private school, initially for first through seventh grades and with some space available for other local children. Being private, we will have control over the quality of the teachers and the learning curriculum. It is a big undertaking for us to build a school and to hire teachers, but we feel this is surely God’s plan for us at this time so that our “gang of six,” as well as all of our other children at Agape, have a chance at a promising future. With God’s help and with your prayers and support, we will work hard to make this school a reality.